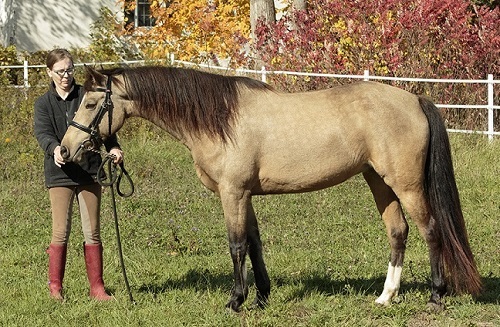 For sale: RDS Bold in Gold (Butter) 14.2 hh 2010 buckskin registered Morgan mare (SFG Jack Frost X Wynter Thymes Hott Toddy). I purchased her in 2016 to be my next dressage prospect but it turns out she has a SI injury which prevents her from doing this job. She has had a SI injection, and is sound for light work, however sitting trot and canter seem to aggravate the condition so I am selling her as a broodmare. She is a super cute mover and at 14.2hh she is a great sport pony broodmare prospect as well as being a registered Morgan. She also had a reproductive ultrasound done in December of 2018, no abnormalities noted. Asking $1,800 CDN + HST. Must be a good home! Located 1 hour north of Toronto, Ontario. Please note in the videos that this is her first ever time jumping.